You are invited to our Winter 2018 Luncheon on Thursday, Feb. 8, 2018. We are pleased to welcome Fr. Michael Sheeran, SJ, President of the Association of Jesuit Colleges and Universities, as our speaker. Speaker: Rev. 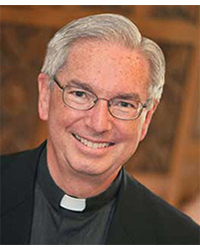 Michael J. Sheeran, S.J. Rev. Michael J. Sheeran, S.J. has served as President of the Association of Jesuit Colleges and Universities (AJCU) since April 1, 2013. Prior to his arrival at AJCU, Fr. Sheeran was the President of Regis University in Denver from January 1, 1993 to May 31, 2012. In August 1993, Fr. Sheeran hosted at Regis the first meeting between Pope John Paul II and President Bill Clinton. He also served as an expert commentator for Channel 4 in Denver during World Youth Day in 1993 and again during the 2005 election of Pope Benedict XVI. Fr. Sheeran received his doctorate in politics from Princeton University in 1977. His dissertation on the Quaker decision-making process — a variant on Jesuit Communal Discernment — is now a book used by Quakers to teach their method to new members of their community. He entered the Society of Jesus (Jesuits) in 1957 and was ordained a Catholic priest in 1970.